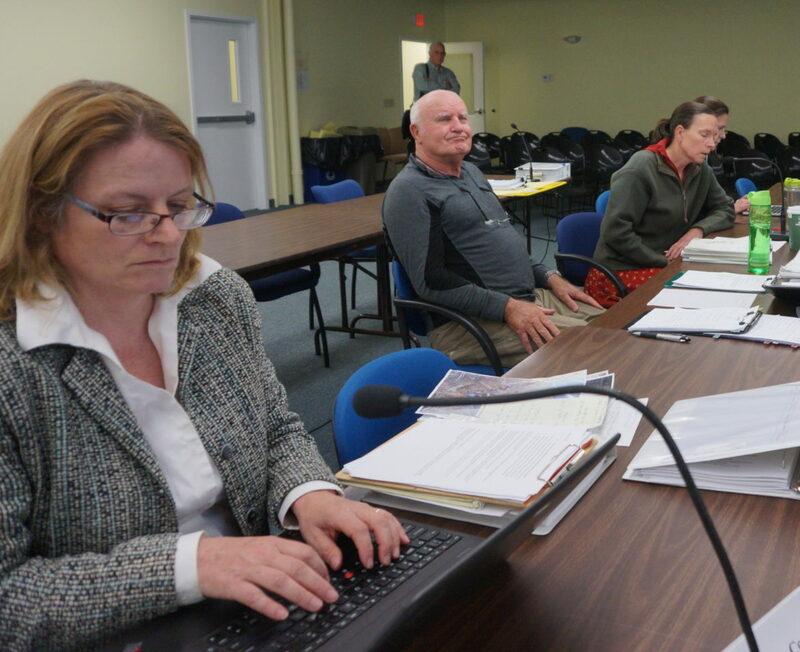 From left: Grafton County Attorney Lara Saffo, Dr. Campbell McLaren, Kris Pastoriza and Christine Fillmore at last Thursday's adjudicative hearing on Northern Pass in Concord. CONCORD — While the Forest Society called Northern Pass’ purchase of five North Country properties through middlemen inflated by $500,000 a “shell game,” the project’s spokesperson Martin Murray said ratepayer dollars were not used and it is common to buy property along proposed transmission routes. Society for the Protection of New Hampshire Forests spokesman Jack Savage questioned Northern Pass’ apparent lack of transparency on the sales. The Society is an intervenor in the controversial 192-mile high-voltage transmission line. The line would run from Pittsburg to Deerfield bringing electricity from Hydro-Quebec in Canada to New England if it wins state and federal approval. “Whatever was going on with that particular Northern Pass land-purchase shell game, it seems odd that a project that purports to be in the public interest has to hide its intentions,” Savage said. InDepthNH.org asked Senior Assistant Attorney General Peter Roth, who represents the public in the Northern Pass proceedings, whether the land purchases were being investigated. “I’m not aware of an investigation at this point and I can’t comment on whether there is one or not,” Roth said. State Sen. Jeff Woodburn, D-Whitefield, did not return repeated calls seeking comment. Judy Reardon, a senior advisor with Protect the Granite State, and formerly served as legal counsel to U.S. Sen. Jeanne Shaheen, was also critical. The five property purchases came to light last Thursday near the end of day 9 of the adjudicative hearings before the Site Evaluation Committee in Concord. At least 20 more daylong hearings will be held on Northern Pass’ application before the Site Evaluation Committee decides to approve or deny it by Sept. 30. Grafton County Attorney Lara Saffo, who represents Grafton County as an intervenor, questioned Northern Pass experts about the purchases. See story here. A Dalton tax card showed one property that was appraised at $13,800 was sold a couple of times before being sold to Northern Pass’ Renewable Properties for $353,800. Saffo provided details to the SEC and Northern Pass experts about each property. “Do you know why the project wouldn’t purchase them directly from the landowner and instead chose to go through four LLCs?” Saffo asked at the hearing. Northern Pass expert Kenneth Bowes said he did not know. 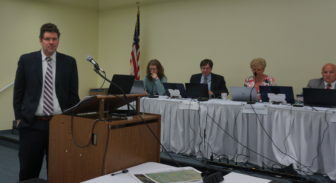 Jason Reimers, attorney for the Society for the Protection of New Hampshire Forests is pictured at the podium with members of the Site Evaluation Committee behind him at last Thursday’s adjudicative hearing in Concord. Murray was critical of the Society for the Protection of New Hampshire Forests. “Recall that, following our initial proposal we were encouraged to establish an alternative route in the North Country that avoided population areas. We were ultimately successful,” Murray said. “I have no further information or comment on the sale or purchase of properties at this time,” Murray concluded. The Site Evaluation Committee hearings will resume on May 31 at 49 Donovan St. in Concord and run through August. The public is welcome.